I recently came across Sam van der Weerden’s work. I had seen his excellent alternative to Otago Regional Council’s bus schematic a while ago, but it wasn’t until I came across his blog, caffeinatedmaps.wordpress.com, that I realised he’d been tunneling into the same hill, and going to even greater lengths in his research to build a picture of the Dunedin passenger transit system. So, knowing that Rail Land really needed a schematic map, he was the perfect person to ask - and here it is: (the poster is yet to come). 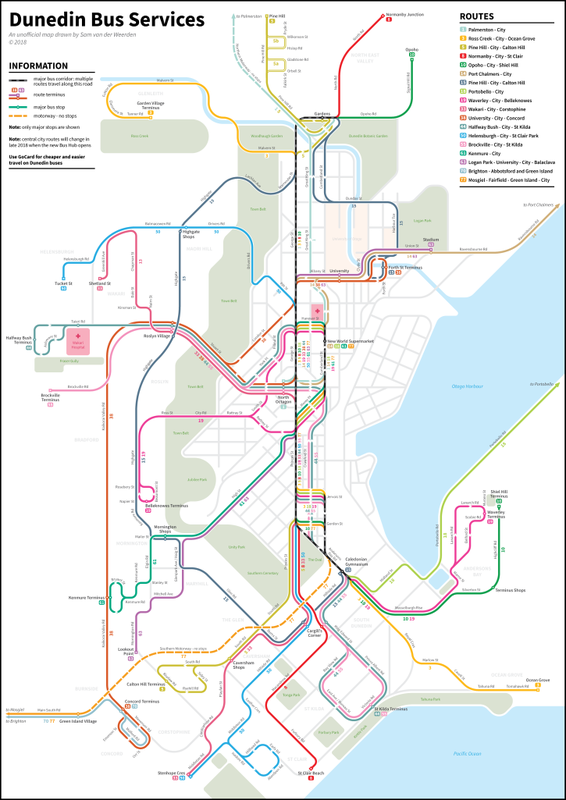 Below are a couple of my favourites from Sam’s work - starting with his map of the Dunedin tramway network, with additions on heavy rail and ferries as well. The modern version of the map here is even better - by removing the nostalgic element, it’s easier to imagine using the system. Interesting to compare this beside Sam’s modern Dunedin bus map and see how it follows the tramways. It also suggests that perhaps I haven’t been giving the system enough credit. It just needs one little additional service - now we’re talking!